The “band” is one of these foundations. Using a horizontal or vertical band as the foundation for your elements simplifies the scrapbook process because it places a limit. Defining the area in which you’re going to work reduces the decisions you have to make about placement. All elements fit within the vertical band on “Cousins,” with embellishing strips running off the edges to break up the white space and add interest. All of Lynnette Penacho’s elements including three photos, journaling and a big title fit within a horizontal band on “25+1.” Lynnette likes using this composition and often stitches a square border or layers a square mat on the background canvas. When you make a banded design like this, the edges of the bands offer opportunities for layering and adding interest. Lynnette has a “stamp” scalloped edge along bottom and top as well as a birthday banner spanning page width. On “Cousins (above), scallops and stitching are added to band edges. Doris Sander likes to shake things up. 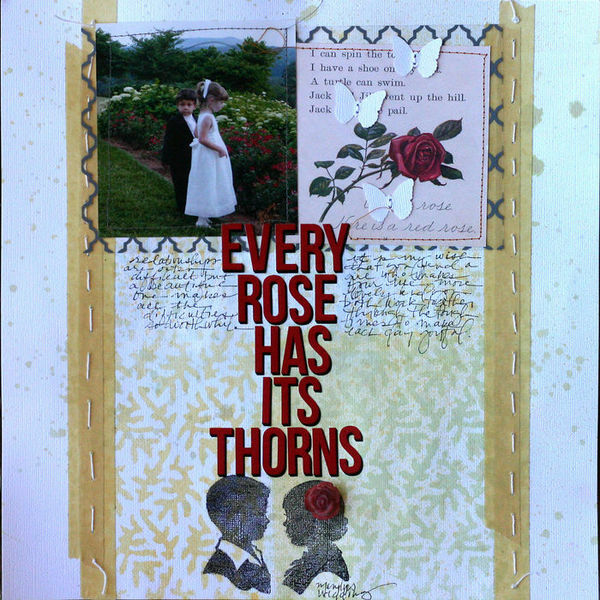 While we’ve all been learning that asymmetry is more visually interesting than symmetry (and, thus, placing our bands off center) she’s gone and centered her wide vertical band on “Every Rose has It’s Thorns” and then reinforced that symmetry with title and silhouette embellishment placement. Still, though, the band serves the purpose of limiting her compositional area and offering edge layering opportunities. Your band doesn’t have to be a solid rectangle. Tami Taylor misted and stamped a curving band across “Kyle.” It guides the eye in a soothing line that complements the music subject of her page. 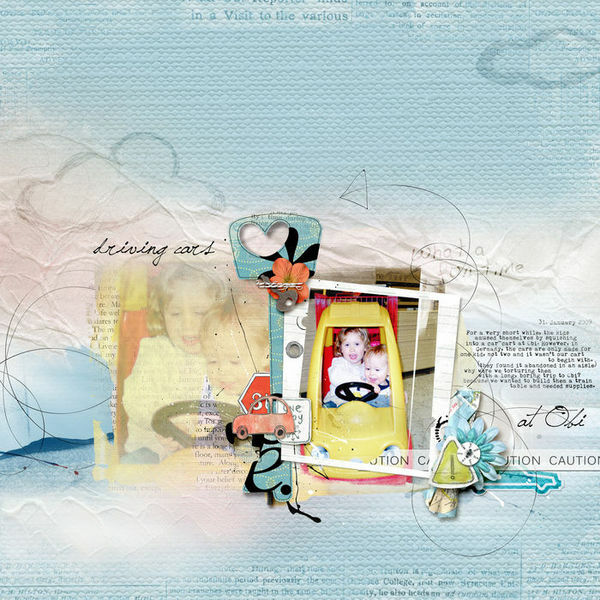 Kyle by Tami Taylor | Supplies: Paper- Bazzill. Spray Inks – Tim Holtz. Stencils/Cardboard – Unknown. Alphas/Wordstrips/Diecut – Jeni Bowlin. You don’t have to stay within the confines of your band. 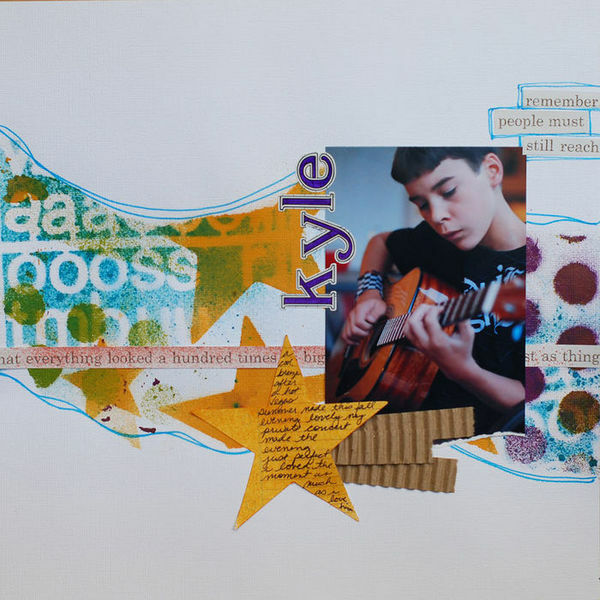 Use it to define a foundation and overall shape for your composition and then “layer it up” as Paula Gilarde has done on “Why.” Her journaling creates a secondary band on the page — this one vertical and placed centered with her largest photo. why? by Paula Gilarde (from MSD Typography issue) | Supplies: Stampin’ Up cardstock; Patterned papers: October Afternoon (floral, stripe), SEI (polka dot), Scenic Route (grid); Stamp: Imaginisce (bird), Studio Calico(faq); Sticker; Jenni Bowlin; Digital Frames: Katie Pertiet (Little Vintage Frames); SS Whimsy Font-journaling. My “Uplifting uses a wide band to hold photos and journaling, but my embellishments, title, and additional journaling spill off top and bottom. These two “spill-off” points combine with the chipboard embellishment within the band to create a visual triangle. Uplifting by Debbie Hodge | Supplies: Artplay Palette Concerto by Anna Apnes; Pippin by Lynn Grieveson; Rimmed Framers 1, King Me, Supersize Decorative Labels by Katie Pertiet; I Believe by Cinzia; Storyteller by ViVa Artistry; Reminisce by Leora Sanford; Amaze, Triumph Tippa fonts. There you have it: the banded foundation is versatile and great way to get your photos and elements arranged quickly so that you can spend time telling the story with your journaling, color, styling, and embellishment choices. OMG I absolutely love all the layouts, and the ideas are awesome. Thanks for all the ideas. I would have never thought to put a band at the top!I love my masterful scrapbook designs but i also never miss get it scrapped either! !